With the 2018 hurricane season in full swing, preparing for a storm should be front of everyone's mind. And while late summer and fall hurricanes do pose serious concerns for the Cape, winter Nor'easters are often just as damaging with the additional possibility of freezing temperatures. To make sure you and your house are prepared to weather any storm here are some specific recommendations to consider. Trees are a major threat to structures, cars, and people in storms. In particular Cape Cod has a lot of pitch pines that tend to snap off large limbs or drop the entire top in large wind events. If you have them, make sure they are far away from your house so that, if they do fall, they won't land on anything important (see right. 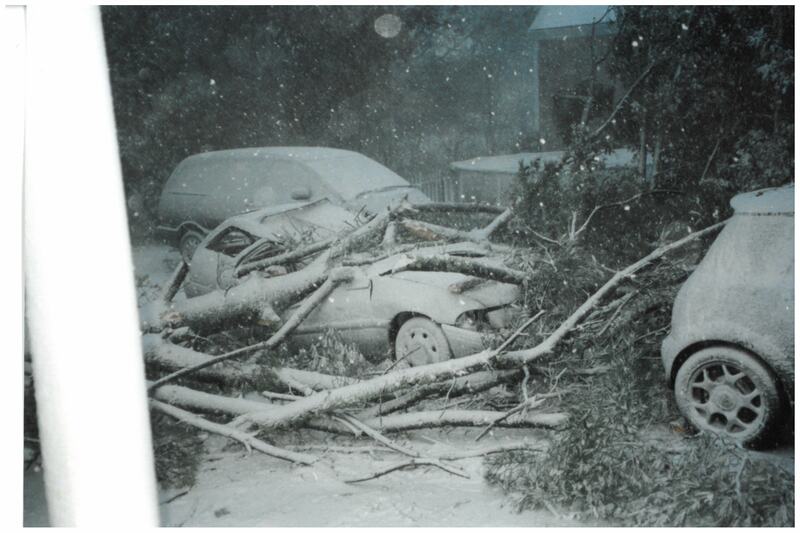 This was the 'Freaky Friday' storm in December 2005. Luckily no one was hurt but the driver had only returned home ten minutes before). Obviously it is important to take a good look at any tree that is close to a structure, not just pines. Additionally limbs that overhang the roof cause more lichen to grow, shortening its life, and leaves and needles clog up gutters adding to drainage issues in heavy rains. We are big fans of self reliance. To that end preparing for the worst is a good way to make the best of a bad situation. Have a grab bag ready in case you lose power for several days. Here is the FEMA website with good instructions too. Crank flashlights and radios are great since they don't need batteries, also make sure you have some way to eat. Your gas may work in a storm but your electric sparker won't so don't forget matches. Also have enough canned food in the pantry for a few days in case cooking isn't an option. Also if you don't want to live rugged at home without power, your bag should include what you need at a shelter, bedding, toiletries, medications and some personal items (games and books!) will make smart additions to a prep bag. During major storms emergency services are already stretched to the max so make sure to get to a shelter before travel gets dangerous or you become an emergency yourself. In winter this becomes a serious decision since power loss often means loss of heat as well. If you have a working fireplace or wood stove stock up on plenty of good dry wood. And get out all those ugly old wool sweaters and down comforters! If you are planning on being out of town or leaving your home for a shelter, turn off the water. This is true even in the summer but especially in the winter. We can't stress this enough. With no heat in your house there is nothing keeping your pipes from freezing and turning your house into a skating rink. Even if your pipes do burst, with the water off, there is a limited amount of damage that can be done. Boarding up windows is a good idea for people who leave for long periods of time. We see it less and less these days since windows are more durable, but it won't hurt. If you aren't boarding up and high winds are expected, consider taping your windows or drape sheets against the inside to reduce broken glass damage. Mind you, those sheets will blow away if a window breaks but they'll also help keep the glass contained. Here is a fun anecdote. Off the coast of Maine, where many small private islands exist with seasonal cottages, many people intentionally leave their door unlocked. Why you may ask? This not-so-secret secret is well known among the fishing and maritime community as a means of survival. Homeowners leave food and blankets on the kitchen table in case a stranded fisherman (or a wrecked one) needs some help. Our favorite part of this story, no one betrays this trust and loots - ever. The lesson here is don't forget to help your neighbors. We hope you found these tips helpful. If you need recommendations for good local landscapers or tree professionals please contact us.